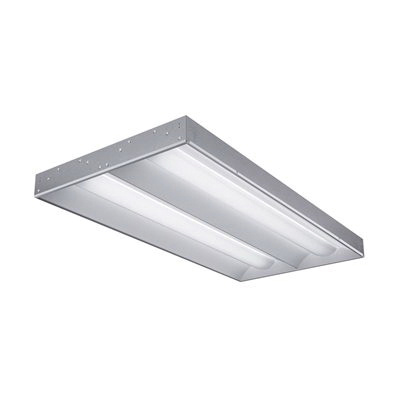 Lithonia Lighting Volumetric recessed lighting uses (2) 28-Watt premier 3500K T5 fluorescent lamps for energy efficiency, superior color rendering and long life. Its 2-piece refractor system uses the combination of diffusing optical film and precisely extruded prisms to efficiently diffuse light. It features sloped endplates that provide a balanced fixture-to ceiling ratio, while enhancing the perception of fixture height. This recessed lighting delivers volumetric lighting by filling the entire volume of space with light, delivering the ideal amount to walls, cubicles, work surfaces and people. It is ideal for offices, schools, hospitals, retail and numerous other commercial applications. Volumetric recessed lighting is UL listed and CSA certified.